Honda today marked the opening of Honda Smart Home United States, showcasing technologies, which allow zero net energy living and transportation. The home, situated on West Village campus of the University of California, Davis, is capable of producing more energy onsite from renewable sources than it consumes annually, including enough energy to power a Honda Fit EV for daily commuting. An energy efficient design and Honda-developed home energy management system will allow the home’s occupant to use less than half of the energy of a similarly sized new home in the Davis area for cooling, lighting and heating. The home is also three times more water efficient than a typical U.S. home. Honda Smart Home US, construction of which began in April 2013, will serve as a residence for a member of the UC Davis community, whose selection will soon be announced. The fully-furnished home comes equipped with a Honda Fit EV battery electric vehicle for the resident’s daily transportation. In addition to showcasing Honda’s vision for sustainable, zero-carbon living and personal mobility, the home will function as a living laboratory where the company, along with researchers from UC Davis and Pacific Gas and Electric (PG&E), will evaluate new technologies and business opportunities at the intersection of housing, transportation, energy and the environment. Honda’s environmental efforts extend beyond personal mobility to address two of the primary sources of CO2 emissions: homes and cars. Together, energy used to power light duty vehicles and homes contributes to approximately 44 percent of United States greenhouse gas emissions in the United States. Technology which enables distributed renewable energy generation to supply power to cars and homes seamlessly is one of the key potential pathways to address climate change. 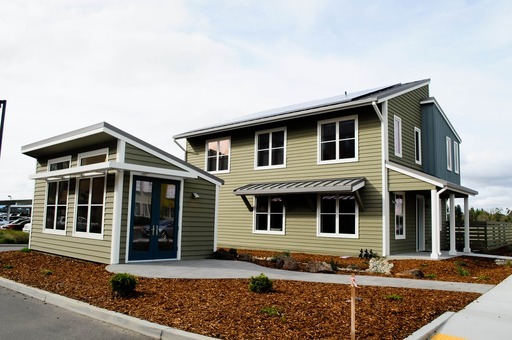 UC Davis’s West Village, where Honda Smart Homes is situated, is the largest planned zero net energy housing development in the U.S. Opened in 2011, West Village is home to the university’s globally recognized research centers focused on sustainability, transportation and energy efficiency. Honda Smart Home US brings together latest green building concepts and innovative technology: The Honda Fit EV included with the home has been modified to accept DC power directly from the home’s solar panels or stationary battery, eliminating up to half of the energy, which is typically lost to heat during AC-to-DC and DC-to-AC power conversion. When the solar panels are generating electricity at full capacity, the vehicle can fully recharge in approximately two hours directly from sunlight. Hundreds of channels of energy data generated by sensors throughout the house will be shared with PG&E and UC Davis researchers. 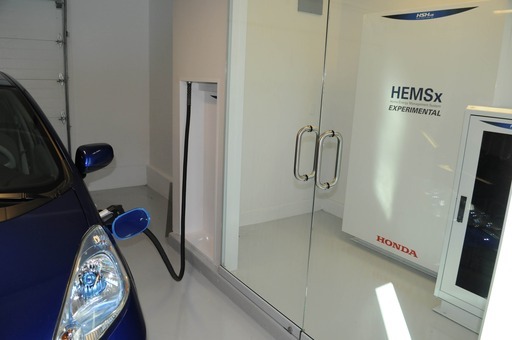 Additionally, Honda’s Environmental Business Development Office, in conjunction with Honda Research & Development, will use the home as a living laboratory to test new technologies and evaluate new environmental business opportunities. 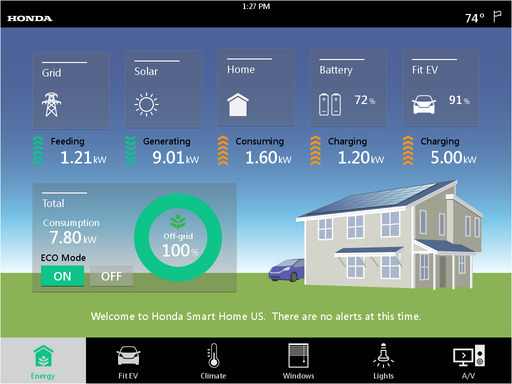 Steve Center, Vice President of Environmental Business Development Office of American Honda Motor Co., Inc. said with Honda Smart Home, we have developed design solutions and technologies to address two main sources of greenhouse gas emissions – cars and homes. Ultimately, our goal is to contribute to the public dialogue about addressing CO2 emissions. Dan Sperling, Ph.D., director of the Institute of Transportation Studies at the University of California, Davis said, in West Village, UC Davis made a commitment to build zero net energy housing and gave our research center the goal of creating the first university hub to focus on energy and transportation research. Honda Smart Home is a dynamic environment, which will help the university meet its research objectives and is a perfect example of the industry partnerships we strive to build. 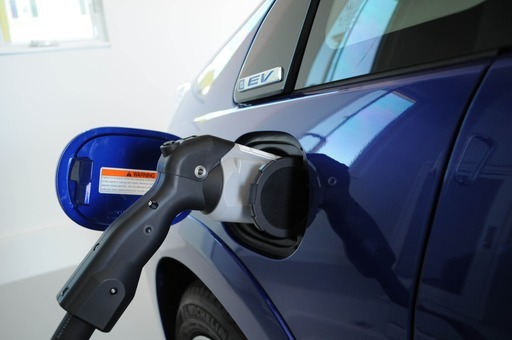 Honda is a leader in the development of leading edge technologies to enhance fuel efficiency and reduce CO2 emissions. The automaker has led the UCS (Union of Concerned Scientists) rankings of overall vehicle environmental performance since 2000, and a Honda vehicle has topped the list of America’s greenest cars from the ACEEE (American Council for an Energy-Efficient Economy) for 11 out of the past 13 years. The company leads all automobile manufacturing companies with thirteen LEED-certified “Green Buildings” in North America. Ten of its 14 North American manufacturing facilities are zero-waste to landfill. Honda established operations in America in 1959, and now employs more than 26,000 associates in its U.S. sales, R&D and manufacturing operations with a capital investment of more than $12.5 billion. Over 95 percent of Honda vehicles marketed in United States are produced in North America, using locally and globally sourced parts.